While the Quicklinks button is not available on the homepage, you can still access to the tool from any Faculty180 specific page within the Interfolio product. The Quicklinks button allows users to have quick and easy access to the screens they use often. For example, if there is a report that is used on a regular basis, and it contains complex filters, the user might want to create a Quicklink to that report so it can be accessed quickly. Each user can create their own Quicklinks, which can be shared with other users if they choose. Click Quicklinks in the upper-right corner of the screen, below the banner, then click Add This Page as a Quicklink. The Add Quicklink dialog box opens. A default name for the Quicklink displays. If you choose, type a new name for the quick link in the Name field. When you are finished, click Save. The quick link is added to your list of Quicklinks. Display the screen that you wish to create a Quicklink for. From any screen, click Quicklinks in the upper-right corner of the screen, then click Manage Quicklinks. The Manage Quicklinks Options screen displays. The top displays the Quicklinks added and managed by the user, at the bottom of the screen, are the Permanent Quicklinks added by an administrator. Click the icon for the desired task (Edit, Share, Delete, or Reorder). To share a Quicklink with other users at your institution, click the Share button. 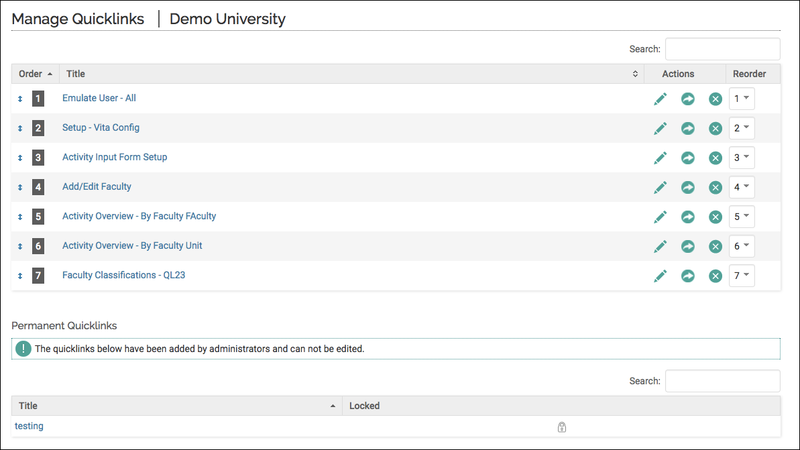 The Send Quicklink window will appear, here you will choose the faculty members that you want to share this Quicklink. Click the Select Faculty button. 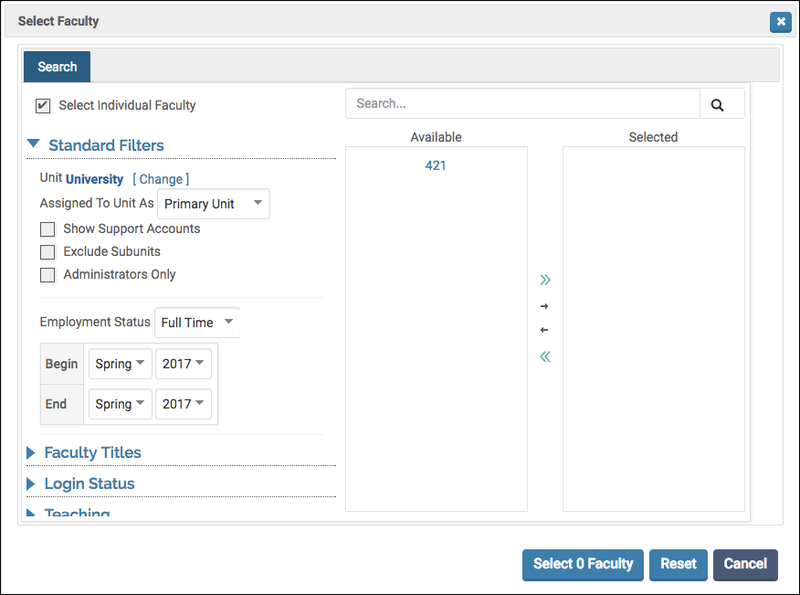 The faculty selector tool will display and it allows users to filter down to relevant groups of faculty users at an institution. Users can use the search bar in the top left of the window to look for specific employees, or they can filter using the options on the left to easily select groups of employees to include in this selection. All faculty members selected will receive copy of the provided a Quicklink and they can view it at any time, if the have the provided permissions to access the page. Use the Faculty Selector to choose the users you would like to receive the Quicklink. When done, click the Select Faculty button at the bottom of the window. Click Save to confirm your selections in the Send Quicklink window.